This review first ran in the June 30 edition of the Hamilton Spectator. My kids did something this month that they’ll still be talking about with their grandkids. They were among a cast of 100-plus kids, tweens and teens who danced at Hamilton Place before a packed house of proud parents, family and friends. They hung out in backstage dressing rooms with their classmates and dance crews. The recital was their reward for 10 months of practice at the Hamilton Conservatory for the Arts with great teachers who were even better role models. The Element is where natural aptitude meets personal passion. “Finding your Element is about discovering what lies within you and, in doing so, transforming what lies before you.” If you’re in your Element at work, you look forward to Sunday nights and Monday mornings. 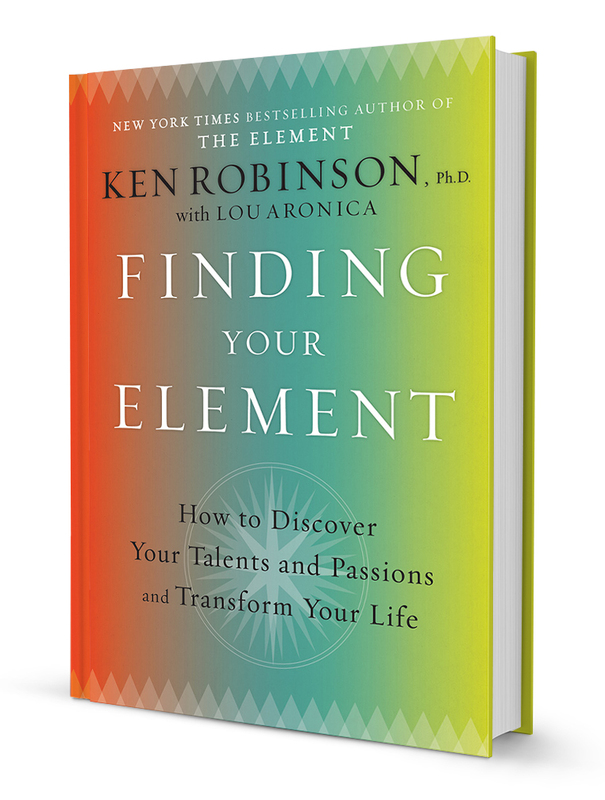 Robinson wrote Finding Your Element as a sequel to his bestselling book The Element. It’s for people who think they have no special talents or passions, who believe they’re too young or too old for a career change and who worry that they won’t even realize when they’re in their Element. My kids found their passion on the stage of Hamilton Place and we have an opportunity to help a lot of other kids do the same. The day before my kids’ recital, a different kind of dance happened across the street at City Hall. Councillors began looking at a new way of funding local arts organizations. Some of those organizations lobbied hard to keep their share of the pie. Other organizations pushed for a bigger pie with more slices to go around. So what if we gave a generous slice to arts programs that engage disengaged kids and teens in our code red neighbourhoods? What if we had professional dancers, musicians and artists work with these kids, instilling self-discipline through practices and boosting their self-confidence through performances and exhibitions? What if we gave these kids the opportunity to shine on the stage at Hamilton Place or Theatre Aquarius and showcased their work at the Art Gallery of Hamilton and in James North galleries? What if we used the arts to transform lives by helping kids discover their talents and passions and develop a strong sense of purpose? The pitch by Live Different was published in the Aug. 2 edition of The Hamilton Spectator. The pitch by the Salvation Army’s Lawson Ministries was published in the July 9th edition of The Hamilton Spectator. The pitch by the organizers of the BRIGHT Run cancer research fundraiser was published in the July 11th edition of The Hamilton Spectator. A record number of more than 30 nonprofits and community groups took part in the 7th annual media relations summer camp (#mediacamp) at The Hamilton Spectator June 24 and 26. The camp aims to help groups make better story pitches and earn more media coverage. The camp is organized by Jane Allison, the Spectator’s manager of community relations, and Jay Robb, director of communications with Mohawk College. The camp is offered free of charge as a thank you to local community builders. The camp kicked off with Jane and Jay giving an overview of the four essential elements of a strong story pitch: answer why should I care and why tell the story now, highlight what’s new and find a poster child with a compelling story to tell. Campers then got a crash course in social media by Chris Farias with kitestring. Chris showed campers how to make your audience aware, make them care and make them do something. Chris also handed out hot-off-the-press preview copies of Start Spreading the News. All proceeds from the media relations handbook, to be sold as an ebook, will go to Spec Kids Unlimited. During lunch, Spectator reporter Molly Hayes and photojournalist John Rennison talked with the campers about ways to make it easier for reporters and photographers to cover events and announcements. In the afternoon, PR pros from the private, public and nonprofit sectors volunteered to help campers polish and practice story pitches and write mock emails. Special thanks to camp counselors Trish Nelson, Jane George, Grace Diffey, Brent Kinnaird, Kurt Muller, Lise Diebel, Margaret Lintott, Alyssa Lai, Sherry Mousavi, Marie Verdun, Megan Bieksa and Maria Hayes. The first day of camp ended with an optional tour of the Spectator newsroom and a workshop on how to use Twitter taught by Margaret and Alyssa . On day two of the camp, Spectator editor Lee Prokaska-Curtis talked about how to submit letters to the editor and op-eds and request editorial board meetings. Lee advised campers to keep letters to around 100 words and op-eds to 750 words. The Spectator receives more than 20 letters a day and has space to publish five. Campers then got an overview from Jane and Jay on how to work with the media, from pitching stories to giving interviews. At noon, a Spectator panel from the newsroom reviewed a handout with 18 email pitches from campers. The panel was asked to provide first impressions and suggestions on how to improve the pitches. Special thanks to reporters Joanna Frketich, columnist Susan Clairmont, photojournalist Barry Gray and editors Cheryl Stepan, Aviva Boxer, Carla Ammerata and Howard Elliott. The panel stressed that less is more in story ptiches. Quickly get to the point and highlight what’s new, why Spectator readers should care and who the reporter could talk with in covering the story. The camp ended with a hands-on workshop on how to do on-camera interviews, along with how to shoot and edit video. Special thanks to Linda Rourke, Kurt Muller, David Smillie, Scott Summerhayes and Sean Coffey. Linda also gave an overview of how to pitch stories to Hamilton Life on Cable 14. Presentations from the camp and a Hamilton media contact list were posted on Dropbox. Thirty campers completed a survey at the end of the camp. Did you gain a better understanding of what reporters and editors are looking for when you pitch a story? Was media camp a good use of your time? Would you recommend media camp to other nonprofits and community groups? What did you value most about media camp? The opportunity to learn how to pitch and who to pitch stories, and that the process isn’t as formal as I’d previously thought. The interaction of reporters and professionals was invaluable. Their in-person delivery of expertise is something that would have been as impactful being delivered without them. It really makes a difference. The information on how to properly pitch a news story and all of the info on how to get press. Having real editors and reporters was a huge plus. Direct advice from media professionals. I really enjoyed the panel of reporters and editors. Their insight was invaluable. The panel with the reporters and editors. Chris Farias was highly engaging and informative. The most beneficial was the media training and panel sessions. Having no insight in the world of traditional media, I found it fascinating. Wow! I have such a fuller understanding of the media. Completeness and deeper understanding of the needs of the journalists. Access to reporters, editors, journalism professors. Most importantly, I am leaving with a better understanding of how media works and how much our media (the Spec) care about the community. The booklet we got to take home, full of tips. The upbeat feel of the camp. It was structured to be of value, specifically to nonprofits so they took into account our perspective and resources. I liked how interactive it was and the constructive criticism. The practical tips of what not to do, almost as important as what to do. Being able to work on a real pitch. Learning that we can send out our own media and don’t need to completely depend on mainstream media. Direct access to the professionals who we need to contact. All of the information. A lot of great tips. The media contacts were great. All of the guests were enthusiastic and wanted to be there. It was a great two days. The chance to learn how to pitch a better story. The opportunity to meet other local nonprofit groups. I learned a lot about strategy behind when you may pitch and story / media release and who you should send them to (ie not a mass send to all reporters). Build rapport. The advice from the reporters, specifically, learning that they really care about our community and want to tell our stories. I really appreciated the Q&A with reporters who gave honest feedback about pitches and what not to do. It was also great to be able to put a face to a name to get a sense of how to pitch to them. Direct feedback from journalists and PR specialists. I like the booklet that was handed out the first day. I valued hearing the perspective of journalists and photojournalists, having feedback from experts and the chance for revision before presenting to media. Developing a pitch for your story. The workshop on interviewing and videotaping was great. I’d like some time at lunch for networking with other groups. there was a lot of content and panels (which was also great) but I would have liked the space at breaks to speak with other groups about their work. Instead of a five minute coffee break, maybe 10 minutes? Have one-on-one time to work on a pitch with a reporter or counselor. I had questions about our pitch but wasn’t comfortable asking in this forum. A little more break time. Even lunch became a learning session. Perhaps have more media relations experts. My group ran out of time before everyone had a chance to discuss their story. I would add a hands-on how to create video with our smartphones. I would also linke to hear from previous alumni from the program on how they are currently engaging the media. A little thing but have the tour of the newsroom and the Twitter 101 at separate times. I really wanted to see the newsroom but wanted insights into Twitter more. More practice on how to focus on your message verbally. Maybe practice interviews in small groups or with partners. At the segment on the first day where we work with our counselors, having time to work one on one on our pitch would help. The group approach was helpful too – just having some one-on-one time would help. More opportunity to connect with other organizations and the media. More time to talk with the counselors about our pitch. The groups at the end involved a lot of standing around which was tiring. I thought I would hate on-camera time, but now that is done I think more hands-on time would be great. I would like to know more about framing / editing. Would have been nice to have a longer period of time with camp counselors. Awesome event. It was a lot of fun. Absolutely fascinating! Great job and thanks for having this opportunity. I love it! I am like a kid in a candy store. So much info! Thanks so much. Thank you so much Jane and Jay. Great job. Thank you, thank you, thank you. Really great camp, thank you! La Luna lunch was awesome. Thank you for this opportunity – amazing. Very valuable. This was a great workshop. Very well organized, informative and definitely impacted our approach to PR. The most helpful and directly applicable that I’ve been to. Excellent! Perfect! The only way to improve – more. This review first ran in the June 16 edition of The Hamilton Spectator. If you want a job done, give it to a busy person. But if you want the job done right, try giving it to a person with a reputation for saying no. Odds are good you’ll get turned down. But if you get an unexpected and enthusiastic yes, strap yourself in. You’ll get someone who’s fully focused and 100 per cent committed. 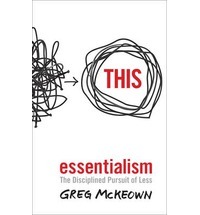 Perpetually busy people are what author Greg McKeown calls nonessentialists. In the school of life, they’re majoring in minor things and practicing the undisciplined pursuit of more. They’re here, there and everywhere. They jump at every opportunity. Put them in charge of a department or organization and you’ll get 35 strategic priorities and projects all rolling out at the same time. You’ll have a team that’s overworked and underutilized. And you’ll also get about a millimetre worth of progress in a million different directions. This doesn’t happen with essentialists. They do less and, in return, contribute far more. “By investing in fewer things we have the satisfying experience of making significant progress in the things that matter most,” says McKeown. Essentialists have figured out an essential truth. If you don’t prioritize your life, someone else will. And someone else’s priorities may not play to your strengths and passions or have you focused on doing what’s most important right now. The key to wealth, health and happiness is to make the highest possible contribution toward the things that matter most. Eliminating the unimportant and nonessential isn’t easy. It means saying no and disappointing colleagues and friends. And that takes courage, compassion and emotional discipline. Essentialists also know life is a game of constant trade-offs. You really can’t have it all. You can try to avoid that reality but you can’t escape it. So stop moaning about what you have to give up and start dreaming about where you can make an outsized contribution. Those contributions will put your essentialism to the test. You’ll eventually face what McKeown calls the paradox of success. People will seek you out with offers and requests. Lead this project. Take this job. Join our board. Chair this campaign. Be at our event. Speak at our conference. @jayrobb lives and works in Hamilton as a struggling essentialist and blogs at jayrobb.me.